The Mechanical Equipment model category covers a wide range of components. Chillers, water heaters, pumps, rooftop units, fans, and more all fall under the Mechanical Equipment category. 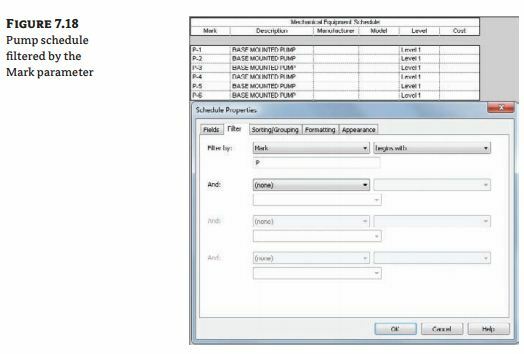 As you have seen, using filters makes it possible to create specific schedules for different types of Mechanical Equipment components. The key to success with these schedules is developing a method that makes the filtering easy to use and manage. use the Description parameter to convey this information. Every item that is placed into a model is given a Mark value. The Mark parameter is another useful parameter for scheduling mechanical equipment. When you manually change the Mark value of an object, the next object that you place that is in the same category will have a Mark value sequential to the value you input. For example, if you place a boiler and give it a Mark value of B-1, the next Mechanical Equipment object you place will be given a Mark value of B-2, even if it is not another boiler. Using Mark values to identify equipment requires you to manage the Mark value of an object when it is placed into your model. having unique Mark values for multiple instances of the same type of component. 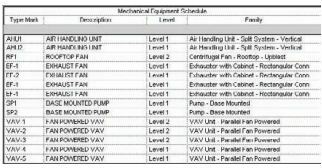 Another way to easily filter your Mechanical Equipment schedules is to create a project parameter called Schedule Type that is applied to the Mechanical Equipment category. You can then assign values for this parameter in order to create schedule filter rules. 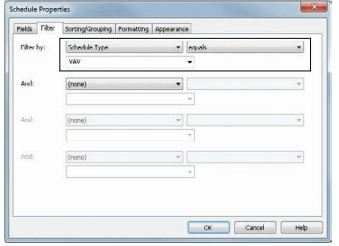 This may be the preferred method, because the Schedule Type parameter could be applied to all appropriate model categories and would give you a uniform method for filtering schedules. If you have a schedule with a column for remarks or notes about an object, the Type Comments parameter can be a useful alternative to creating a custom parameter. The value of this parameter can refer to text notes associated with a schedule.